Wolves have captured our imaginations in fairytales, movies and folklore throughout human history. 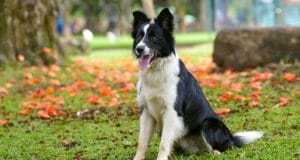 The similarity of the species to domestic dogs can tempt us to try cross-breeding them with the wild wolf, but the results are frequently disappointing. As Cesar Millan explained in a 2010 episode of “Dog Whisperer” on wolf-dog hybrids, there is a world of difference in that tiny fraction of DNA that separates dogs from wolves — about 1% in the case of the former, versus nearly 2% in the case of humans and apes. Michael Hodanish learned this when a roommate left him with a wolf-dog named Heidi, with whom he very quickly bonded. After Heidi passed away, he obtained two more wolf-dog pups, one of whom died, leaving the other howling uncontrollably until he began fostering dogs from local shelters. In his work as a foster companion, Hodanish learned that wolf-dogs brought to the shelters were usually euthanized unless a wolf-dog sanctuary could take the animal. 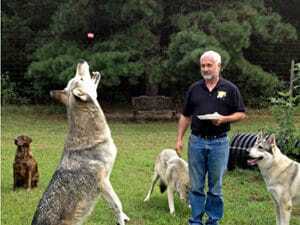 This inspired him to found Howling Woods Farm, an animal shelter in Jackson, New Jersey dedicated to rescuing and placing domestically bred wolves, wolf-dog hybrids, and dogs native to northern parts of the world while educating the public. 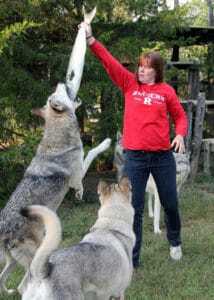 Training wolf mixes can be very different than dog training, depending on “content level,” which refers to how much wolf is in the hybrid. Hodanish explains, “A high content wolf-dog is mostly wolf with a small amount of dog, and a low content wolf-dog is mostly dog with a small amount of wolf.” A mid-content wolf-dog, then, would be about the same on both sides. The fear factor Hodanish describes is supported by science. Researchers at the University of Massachusetts discovered that wolves develop faster than dogs, relying on nothing but their sense of smell in the early stages of puppyhood, while they’re still blind and deaf. As each new sense emerges, they are initially shocked and afraid of the new stimuli. As in choosing any breed, a potential adopter must carefully research and self-assess before committing to this type of animal companion. Many experts agree that wolf-dogs are not ideal pets for everyone. Do you have firsthand experience with wolf-dog hybrids? Tell us all about it in the comments below.